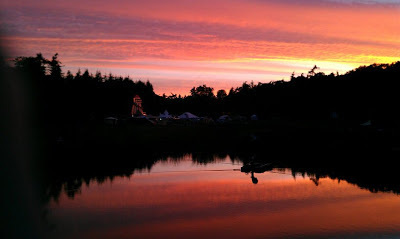 Here's a picture I took at a festival. I've been wanting to try this for a while, and finally did!! Unfortunately I had no lilac coloured lipstick so I wasn't able to do the look I wanted, but I tried to pull it off with what I have. I loved the final look, and what I love more, is that this look is all from High Street products. From left to right we have Hot Chilli, New Black and Dreamy all from 17. Then Pink Pout from Revlon and colour 34 from BarryM. I also used the yellow dazzle dust by BarryM in number 76. They key to this look is blending. This look didn't take me long. 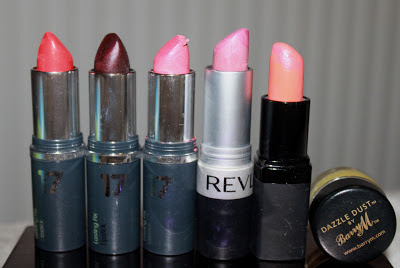 I laid out all my lipsticks and just went for it, showing you the ones I used. I started off at the top of my lips using New Black, blending into Dreamy and then into Pink Pout. My bottom lips I used the coral shade from BarryM, then adding Hot Chilli at the bottom. I then added the yellow powder on the top of the bottom lip to create a contrast between the coral shade at the bottom and the pink shade at the top. To apply the lipsticks I used a lip brush, but also used some shades from the bullet. This is such an easy thing to do if you focus on blending. This was so much fun to do as I haven't done anything like this in a while. I really hope you like the look of this and I hope you give it a go. Anyone can try this look, I'm not trained in beauty. Thank you for reading, and I hope you enjoyed it. Oh gosh this is amazing! So beautiful. Wow your lips look amazing! Such a creative idea! I love it!